Still searching for the perfect yard decoration? Our beautiful handmade heart ceramic pots. Something different for that “SPECIAL VALENTINE”. These pots are unique in design and a stunning addition to any area of your home or garden. 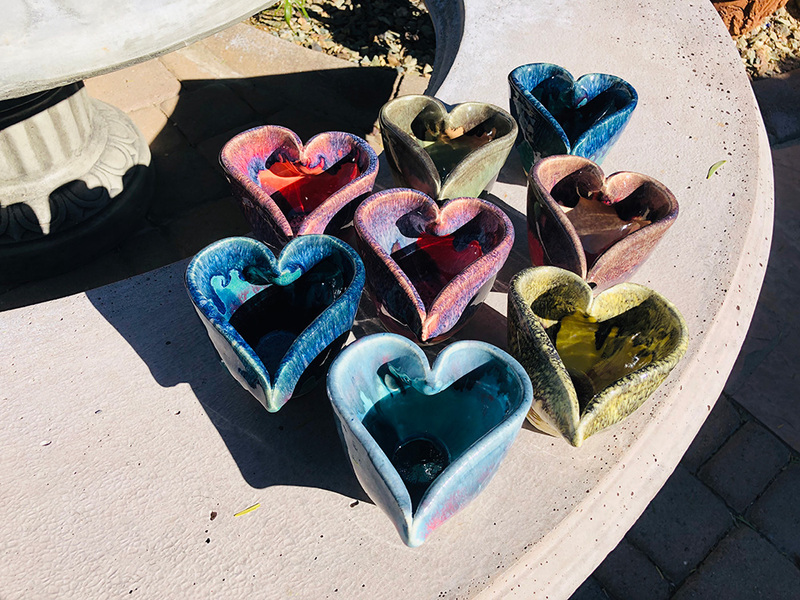 ENJOY 10% OFF all heart pots! Click below to download the coupon! Offer will not last long. Arizona’s heat can play havoc with all plants; and roses are no exception. Our sunny climate is good for roses and with proper care, roses will flourish in the desert. Be sure to purchase your roses from a good local company. This should assure they are accustomed to our extreme heat. Feeding and watering the correct way is essential to the health of any rose bush. Watering: Roses should be watered deeply and slowly to assure water reaches the roots. Using a long rod will make sure water has reached a depth of 18 to 24 inches. During hot weather, water every day and if the top two inches of soil are dry, it is time to water. Feeding: During growing season, you should fertilize every 6 weeks. Do not fertilize during the summer. Begin fertilizing again during September-October with a slow release fertilizer. Watering roses after fertilizing is extremely important to the health of your plant. Mulch: Spreading mulch on the base of your rose bush will help keep the soil moist. Spread it approximately 3-4 inches and replenish as needed. Pruning: pruning roses in late January and early February is an ideal time. Use diagonal cuts when pruning and remove all the broken, diseased and weak limbs. Insects and diseases are a nightmare for rose bushes; so check for them often. There are many bug control and disease prevention products available to help keep your roses beautiful. Weed prevention: weeds are starting to grow fast, that’s when they are easier to control, keep on with spring planting. Start planting for summer. Check your watering system, everything needs more water and fertilizer. In the vegetable garden: Plant beets, bush beans, cantaloupe, corn, eggplant, peppers, radishes, summer squash, tomatoes, watermelon and winter squash.